IDP 659000 ribbon cartridge is a full-color SMART printer ribbon with a fluorescing panel that also prints high-security florescent images on your ID badges & cards. The clear overlay panel covers the front if your ID badges with a thin protective film for tamper-resistant plastic cards that can last years longer than standard cards. The fluorescing panel (F) produces grayscale images and text that only appear when your ID card is exposed to ultraviolet (UV) light - a significant security feature that help prevent fraud, counterfeiting and forgery. IDP 659000 prints ID cards and badges on the SMART 30 and SMART 50 printers that are ideal for high security government and business operations. 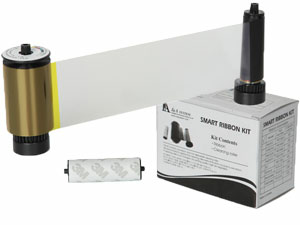 IDP 659000 YMCFKO ribbon cartridge installs easily and includes a cleaning roller for easy IDP SMART printer maintenance. It produces 200 card prints. IDP ribbons have been designed to print high-quality images with IDP card printers. By using genuine IDP ribbons, your printer will produce sharp photos and clear text. © 2005-2019 Idesco Corporation All Rights Reserved.